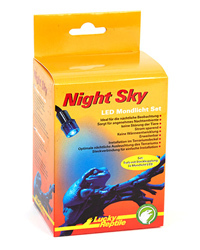 The Night Light LED set imitates the light of the moon and makes nocturnal observations of the reptiles and amphibians possible, without disturbing the animals. Advantages of the LED technology are low energy consumption, low heat emission and long life of the light diodes. Therefore, illuminating terrariums all night is possible, without hindering the natural nocturnal drop in temperature as with other light sources. Especially night incandescent lamps consume a lot of energy and consequently produce a lot of unwanted heat as well. The Night Sky LED set contains 3 Moonlight LED's and an electric transformer, with which up to 6 LED's can be powered. Additional LED's are available from our shop. The LED's are connected to the transformer by a connector, which makes them easy to install. Mounted at the top of a terrarium, they enable a well-balanced nocturnal illumination of the whole terrarium.